Want to know how better to reach your students? 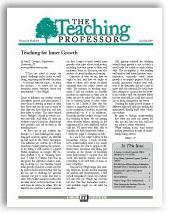 The JSRCC Library now has an online subscription to The Teaching Professor, an acclaimed newsletter devoted to the art and science of better teaching. Student Engagement: Does It Always Improve Learning? Our new online subscription includes the newsletter published 10 times a year, plus online access to the last 10 years of issues. When the A-Z Resource List appears, click on the T tab from the alphabetical list of tabs located near the top of the screen. When the list of databases that begin with T appears, click on The Teaching Professor link. Off-Campus: If you access the The Teaching Professor from this post or from the library’s web site from off campus, you will be prompted with a Virginia’s Community Colleges login screen first. Login with your My JSRCC username and password.